Kensington Mini Battery Extender and Charger for iPod; iPhone 1G, 3G: power to iPhone people! Ok, the iPhone doesn’t exactly score that high when it comes to battery life. That’s why battery packs are becoming so popular! The Kensington Mini Battery Extender Pack And Charger For Iphone And Ipod Provides A Go-anywhere, Backup Battery Pack So The Music And Videos Can Keep Playing. Rechargeable Battery Pack Extends Playing Time Up To 100 Hours Of Music; 21 Hours Of Video; 6 Hours Of Talk. Features AC Power Adapter With Usb Allows You To Recharge Your Battery Pack Includes Dock Connector To Power And Charge Your Iphone And Ipod and it’s compatible With Any Ipod With Dock Connector. The Kensington Mini Battery Extender it’s now US $28.48 (you save 43% off the regular price!). iPod, iPod touch and iPhone power! Battery packs and charging solutions and power-full accessories, at last! Power to (iPod- and iPhone-)people! When it comes to battery life no one’s safe these days: you see iPhone users stuck with neither cell nor music available! Here comes a triplet of different apprach suitable to iPod, iPod touch and iPhone users (letting them save a bundle in the process!). Here’s a really elegant solution to power shortage! 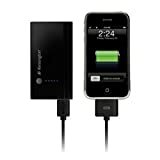 Kensington Battery Pack and Charger for iPod; iPhone 1G, 3G! Got a lot of music and videos on your iPod? The rechargeable Kensington Battery Pack and Charger for iPhone and iPod provides a go-anywhere boost of juice so that the music and videos can keep playing. Simply connect the lightweight Battery Pack and Charger to your laptop or notebook computer’s USB port to recharge it, and you’re ready to give your PDA, cell phone, iPod, iPhone, or other mobile devices the power boost it needs. We’ve all been there: You’re away from home, your iPhone is dead, and you really need to call someone. Or maybe you just hopped on the bus, and the only empty seat is next to that lady who talks to everyone—and your iPod just ran out of juice. Kensington’s battery packs can come to your rescue, recharging a dead iPhone or iPod without the need for a really, really long extension cord. The larger version comes with an AC adapter and a USB cable, so it can be charged from a wall outlet or from a powered USB port. An array of five blue LEDs progressively lights up to indicate that the battery is charging, and a test button lights the array to indicate the charge percentage. Connecting it to an iPhone was cumbersome in a tight space, however, because the connector cable is more than 3 feet long. Fully charged, the larger battery pack will keep the tunes flowing for up to 100 hours—or ten hours of iPhone talk time. For little more than US $ 10 you can get a road warrior kit for iPod along with regular power line charger, car charger, headsets, elastic armband, skin case plus LCD screen protector! 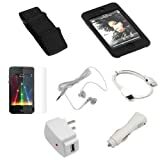 Check the Bargaincell kit: you get USB Data Cable + USB Car Charger + USB Home Charger + Black Rubber Silicone Skin Case + Elastic Armband + Clear Reusable LCD Screen Protector + White 3.5mm Stereo Headset for Apple Ipod Touch Itouch 8GB 16GB 32GB 2G 2nd Generation ! Wanna squeeze all the power you can from your battery? If so, the 3GJUICE Black 2.0 1800 mAh/2A DeLuxe Version may come in handy! Top battery, stronger then any other cable less battery. 3GJUICE Black 2.0 1800 mAh/2A DeLuxe Version charges your iPhone from 10% to 100% in just 2.5 hours. Remove the battery and your iPhone is charged 100%. Compact in size. Can attach directly to iPhone, iPod, iTouch without the use of cables. Can be used while iPhone/iPod is in use. No need to remove any cases when they have an opening for the 30-pin connector. Can hold a charge for 9 months when not in use. Has OFF-button for real shut down. 1800 mAh battery, strongest clip on battery in the world with no cables for the iPhone. Excellent quality with high-end parts. Price for the 3GJUICE Black 2.0 1800 mAh/2A DeLuxe Version is now US $ 54.90 (16% saving)! You are currently browsing the archives for the Kensington category.